Home > Supplements > Solaris Plant Science CardioHDL 1 oz. 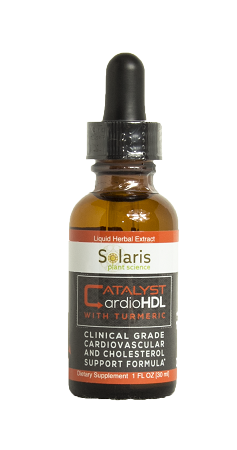 Catalyst Cardio HDL is Solaris Plant Science’s clinical grade heart and cholesterol support formula. As the body’s tissues cannot function properly without sufficient blood perfusion, circulation remains the cornerstone of overall wellbeing. Due to our modern diet and lifestyle, many people have advanced nutritional needs to keep this crucial system in balance. Cardio HDL was formulated specifically with these populations in mind, to help maintain blood pressure and cholesterol levels within the normal range. As free radical damage is a common concern for those looking to maintain heart health, Cardio HDL is more than a simple cardiovascular tonic, providing top-tier antioxidant performance to help protect your body from a wide variety of toxic insults. Herbs like Turmeric [Curcumin], Hawthorne, and Rosemary have been the subject of numerous studies around the world that aim to identify the specific phytonutrients responsible for their documented cardiovascular benefits. Solaris Plant Science applies modern laboratory techniques in service of the wisdom of traditional herbalism, and the result is a clinical grade product that you can truly feel. As with the rest of Solaris’ product line, Cardio HDL is 100% plant-based and entirely free of fillers or preservatives of any kind.